Uni-Vest™ is the world’s leading fitness, weight loss, and sport performance weight vest. Uni-Vest™ from IRONWEAR® is the only weight vest line to be endorsed by Reebok™and sold by Reebok™. It is used by more athletes and trainers around the world than all the other weight vests combined. 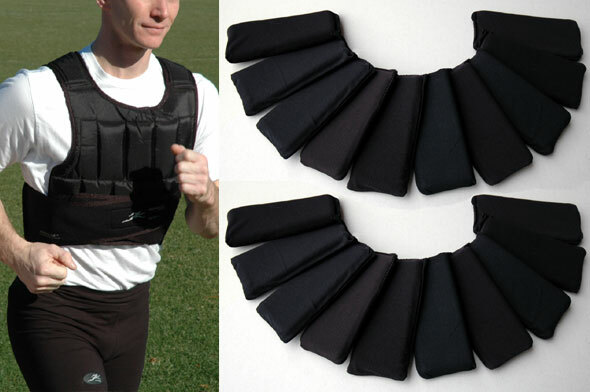 Uni-Vest™(short) sleek patented compact design is the world’s best and most popular weighted vest. The basic short Uni-Vest™ is adjustable from 1 to 20 pounds. Individual ½ pound patented Soft Flex-Metal® Weights fit into unique stretch pockets which hold the weight securely on all sides. The soft rubber weights are evenly distributed over the vest and bend with your body. Uni-Vest™(short) fits tighter and provides more comfort that any other vest. The Soft Flex-Metal® Weights conform to the shape of your body and become one with your body. In case of a fall the weights protect against the impact. Uni-Vest™ (short) is in a league of its own. The proprietary oversized overlapping elastic strapping system holds the vest securely to almost any size torso while allowing for expansion and contraction of the chest during rigorous exercise. Uni-Vest™ (short) has a heavy padded ballistic Nylon shell for maximum durability and soft fabric covered double stitched edges for comfort. The shoulder straps are strong and flexible to allow for a full range of motion. Uni-Vest™ (short) is supplied at 10 pounds, but is adjustable up to 20 pounds by installing the additional ½ pound Flex-Metal® weights that are included. The individual weight pockets are supplied with one weight insert in each pocket but they will accept two inserts. Uni-Vest™ (short) can be expanded up to 44 pounds with the purchase of an Under Vest™ which adds additional pockets for more weight inserts. Uni-Vest™ (short) Flex-Metal® weights are covered by our factory limited lifetime warranty. Unlike other vests which use cheap weights, our the weights are the most expensive part of the vest and are very durable. Uni-Vest™ (short) vest shells are the most durable in the industry and are also cover by our factory limited lifetime warranty. In the unlikely case that you wear out or damage your vest shell, we sell vest shells for about half the replacement price of a new vest. For example we have one professional football team which bought 20 Uni-Vest™s 10 years ago and uses them daily, this year they bought new shells. Now they are new vests at half the replacement price. Uni-Vest™ (short) are they best value in the industry. IRONWEAR® challenges you to find a better weight vest. 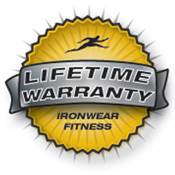 IRONWEAR® has been supplying Flex-Metal™ weight vests all over the world for over a decade. IRONWEAR® is the design and technology leader for weight vests. A few years ago there were only a couple different types of weight vests, now more are available, including a number of vests which claim to be “Ironwear”, have soft weights and even “Flex-Metal”weights, or claim to be “Uni-Vests” using our trademarks and patents without a license to try to get you to buy their illegal imitations. Imitation may be the most sincere form of flattery, but these imitations have been of terrible quality, quickly falling apart and the weights often dissolving, these companies have also been falsely selling and advertising weights as “Ironwear”. “Uni-Vest” and even “Flex-Metal”. You as the customer need to beware!!! Please contact us if you see or have purchased any imitations of our products so that we can take appropriate action. Just so you know IRONWEAR® invented soft flexible weights and Flex-Metal®, the overlapping neoprene belt system, stretch belting to allow the user to breath, the stretch internal pocket system, the short and long sizes, the laminated nylon shell to name just a few items. What you should know and you are not being told!!! All weight vests are not the same and you do not necessary get what you pay for!! Many of the weight vests are made with STEEL or LEAD BARS including Xvest™,Vmax™, ResistanceWear™ and many others. 1. Steel and lead bars are cheap. 2. They are heavy. 1. Exercising with metal bars against the body has the potential to be very dangerous and should be done with extreme care. If you fall or bump into some one the solid metal bars may cause you or another harm. 2. Solid metal bars do not conform to the shape of your body and can cause tissues damage when you move. 3. Solid metal bars can interfere with your movement, and because they do not flex they can block your ability to twist and bend. 4. When you walk quickly, run or jump the solid metal bars move up and down. This jarring motion can cause more harmful impact on the knees, shoulders and spine. 5. Vests made with solid metal bars tend to hike up the torso during many exercise like jumping rope or running. The wearer soon finds the vest has hiked up to his neck and is hitting his chin. 6. You can not do floor exercises such as sit-ups without the bars pressing into you. 7. Lead bars are by their nature toxic and must be handled with care and checked to make sure no lead is leaching out, coated lead can still leach out. Disposing of lead bars can also be difficult. 8. Vest made with solid metal bars must have the bars placed in a locations where you will not bump or press into them. For this reason they can not be positioned uniformly over the body. Many vests are made with metal shot such as Valeo’s weight vest and many others. Good things about metal shot. 1. It is cheap. 2. It is less dangerous than metal bars, so long as it is not lead shot. Bad things about metal shot. 1. Metal shot settles at the bottom of the bags creating lumps in the vest. 2. Metal shot bounces in the bag when you move. The more you move the more the shot moves around, increasing the impact on your knees, shoulders and spine. 3. When you bend, the lumps press into your body and cause localized pressure. Metal shot does not bend with you, it resists your movement. 4. Floor exercises are often painful due to the lumps. 5. The movement of the metal shot also causes the vest to hike up in the same way as the metal bars. 6. The movement of the metal shot in the bag causes the bag to wear out quickly and leak. 7. Never buy vest that uses metal shot made of lead. As the lead moves against itself it creates lead dust, the dust passes through the fabric easily and this dust is very dangerous to you and especially children. See lead poisoning. Uni-Vest™ (short) with Flex-Metal® does not have these problems, these vests: stay in place, let you breath, let you move, distribute the weight evenly, are thin, flexible, form fitting, most orthopedic shape, most durable, most comfortable and above all the safest vest line in existence.